Keiko Fuji, also known as Junko Utada, has died today. 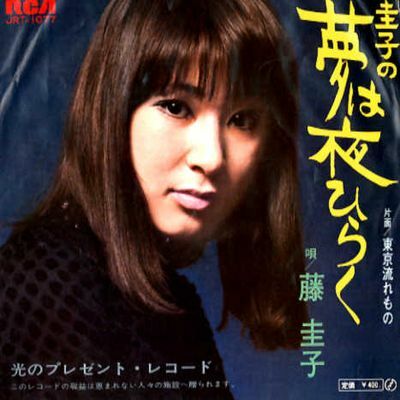 She was Hikaru's mother, as well as a singer herself in the 1970s. From all the fans, our sincere condolences to Hikaru and the Utada family. On Monday the 26th, Hikaru and Teruzane posted statements on Hikki's Website in the messages section. "On the morning of August 22nd, my mother took her own life. There have been many speculations going around, so please let me talk about a few things. For a long time, she had been suffering from a mental illness. With that disposition, it was very difficult to get her to receive treatment on her own will. I was always troubled about what to do as her family, and what would be the best for her. Since I was little, I've watched the progression of my mother's illness. As her symptoms got worse, her distrust for people including family continued to grow, she became uncertain between reality and fantasy, and lost control over her own emotions and actions. I was just tossed around by it and wasn't able to do anything. I wish that my mother has been released from her longtime suffering. At the same time, I am too sad and my sense of regret only grows. She was misunderstood a lot... she was a coward but had a strong spirit, she was filled with a sense of justice, she loved to laugh, was quick in thinking, impulsive and dangerous like a child, careless that you couldn't leave her alone, and more lovely than anyone else. Even though I have many sad memories, she is laughing when I think about her. I feel proud that I am my mother's daughter. I am very thankful that I was able to meet her. I've received many heart-warming words and realized that I am supported by many people. Thank you very much." With regards to the late Utada Junko's suicide, I would like to sincerely apologise, both as representative of the agency to which she belonged to and as her former husband of 25 years, for all the trouble and inconvenience this incident has brought about to all those concerned in the various industries, to the fans of Fuji Keiko, and to the fans of Utada Hikaru. I would also like to take this opportunity to express my heartfelt gratitude and thanks for all the kind words and well-wishes sent to both Utada Hikaru and myself. Ever since I met her, I recognised that there was some degree of emotional instability within her, but instead of seeing it as a mental illness, I simply came to terms with it by viewing her as a uniquely "whimsical" person, and perceived it as something I could deal with adequately enough. It was when Utada Hikaru was around 5 that these emotional changes started becoming more noticeable. She would launch aggressive words and actions towards my mother, the late Takeyama Sumiko, and even Hikaru and myself soon became the targets of her attacks. However, her emotional changes were frequent, and days where she'd go, "Sorry, I've caused trouble again", and reflect on her actions a few minutes after her outbursts continued on for a long period of time. When her suffering became more frequent, she was advised on numerous occasions after being examined at hospitals to undergo appropriate treatments, but this advice instead caused her to develop feelings of mistrust towards me. In the end, I believe that her suffering became a lot graver as the years went by and she continuously refused treatment. In these twelve recent years, she lived life as she pleased, going on vacations and trips when they came to her. She got an American visa that allowed her to stay in the country for a maximum of five years upon entry, and made New York her base, frequently travelling to the European countries, various parts of America, and Australia as and when she felt like it. While living such a lifestyle, she would call Hikaru and myself regardless of the time of day and without any prior notification; while there were times where she'd ask "How're you doing?" and the conversation would continue on normally, there were also times where she'd yell at us for no apparent reason, and we were very worried about her, her mental condition speaking to us very plainly through her words. The last time I spoke with Junko was on the 14th August this year. It was her who called me. This time, it was one of the few occasions where Junko's voice had a cheerful tone and she sounded energetic. It lasted eight minutes, including some small talk, and after accepting a few requests from her, I hung up the phone. And eight days later, she committed suicide. It is impossible to know whether Junko made an active decision to take the leap, or whether it was an act of impulse. All I can say is that I am filled to the brim with regret for having been unable to help her in her situation, and with sadness for having lost someone dear to me. I would like to express my gratitude towards everyone who has watched over Utada Junko and Fuji Keiko with all their love on her behalf. Thank you all very much. The time I spent with Junko is firmly engraved into my memory, and will never fade away. Please accept my sincere gratitude to you on my late mother's behalf. Thank you for all your support and help for a long time. I would like to tell the following to all who still kindly care about my mother. My mother's real name was wrongly reported in the latest articles. It is not Junko Abe, but Junko Utada. My mother wished to keep Utada's surname, not her maiden name Abe even after she divorced my father, so she kept herself in my father's family registry. They were deeply bonded no matter if they are married or not. My mother had been keeping in touch, not only with me, her daughter but also my father until just before her death. My father is one of the few that my mother would turn to till the last. I suppose the people of Shinjuku police station decided that my father should identify and receive my mother's body, by taking such facts into account. My father played this role with intolerable pain, on behalf of me who was in no state to go to Shinjuku police station that day. Some people wished to see my mother's body, but I was obliged to decline such requests respectfully. I would like to take this oportunity to apologize to you for the inconvenience. It was my decision as the chief mourner, by considering my mother's feelings. I guess there might be some people worrying about my mother, or having a doubt in mind by hearing the report that no funeral service is going to be conducted but cremation only, in the whirlpool of various information(which most likely contains inaccurate ones too). It is reported that there were no notes left, but there exists a will written early this year. The will is very my mother, written in a very frank manner, leaving no room for different interpretations. Based on the content of the will, we are trying to send her off in a style that follows my mother's wishes as close as possible. My mother had this policy of not attending the funerals of relatives and acquaintances, but praying for them instead in her own fashion, in her private time. I hope that, if you know my mother well, or think of what's best for her, then you would understand she was not the type of person who would show a preference for those events like funeral ceremonies or memorial services. I myself have been a fan of Keiko Fuji. I am still a fan of her, and I will always be.